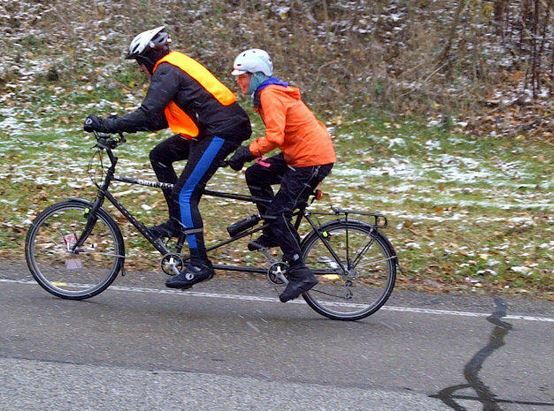 From the 2012 Dirty Dozen bike ride – why not take the tandem bike out for a spin on the 13 steepest hills in Pittsburgh? I have been known to head out to watch some of the more unusual sporting events that have stopped in Pittsburgh. For the record, watching the weighin for the Bass Masters tournament live was far more exciting then one would think. A few years ago, in my effort to participate in all things Pittsburgh, I convinced a few friends to join me on the Saturday after Thanksgiving to stand in the freezing cold and snow to watch the Dirty Dozen bike race. The Dirty Dozen bike race has been taking place on the hills of Pittsburgh on the Saturday after Thanksgiving for the past 31 years and will take place for the 32nd time this Saturday. The race was started by Dan & Tom Chew and Bob Gottlieb back in 1983 as a way to show off the steepest hills in town. You can read more about the history of the Dirty Dozen bike race here. The race is fun to watch but please be careful! For many of the hills there is not a lot of extra space for spectators and spectator parking. From my experience, it is hard to get to every hill. If you want to watch. I would pick a few hills to visit to watch the race. That way you will have plenty of time to get from one hill to the next and not have to worry about rushing. If your only going to go to one hill… you will probably want to check out Canton Ave in Beechview. This is hill number 9 and I am guessing the riders won’t get there until after noon. While there aren’t published times for the race, I’d keep an eye on Twitter #DirtyDozen – I am sure there will be some spectators tweeting the race and you can get a sense of where the riders are on the course. A complete route guide with driving and bicycling directions is available online here. From the 2011 program It’s Pittsburgh and a Lot of Other Stuff by Rick Sebak. According to this press release the Pittsburgh based Cycling Fusion will have 9 cameras livestreaming the Dirty Dozen bike ride.